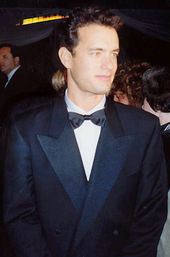 Thomas Jeffrey Hanks was born in Concord, California on July 9, 1956, to hospital worker Janet Marylyn (née Frager) and itinerant cook Amos Mefford Hanks. His mother was of Portuguese descent (her family's surname was originally "Fraga"), while his father had English ancestry. His parents divorced in 1960. Their three oldest children, Sandra (later Sandra Hanks Benoiton, a writer), Larry (an entomology professor at the University of Illinois at Urbana–Champaign), and Tom, went with their father, while the youngest, Jim (who also became an actor and filmmaker), remained with their mother in Red Bluff, California. In his childhood, Hanks' family moved often; by the age of 10, he had lived in 10 different houses. In March 2015, Hanks appeared in the Carly Rae Jepsen music video for "I Really Like You", lip-syncing most of the song's lyrics as he goes through his daily routine. His next film was the Steven Spielberg-directed historical drama Bridge of Spies, in which he played lawyer James B. Donovan who negotiated for the release of pilot Francis Gary Powers by the Soviet Union in exchange for KGB spy Rudolf Abel. It was released in October 2015 to a positive reception. In April 2016, Hanks starred as Alan Clay in the comedy-drama A Hologram for the King, an adaptation of the 2012 novel of the same name. Its the second time he was directed by Tom Tykwer after Cloud Atlas in 2012. In October 2017, Hanks signed on to star as Finch, the last surviving man on Earth, in the science fiction drama Bios. Principal production will commence in February 2019. The film is set to be released on October 2, 2020 by Universal Pictures. 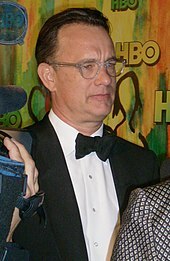 In February 2019, Hanks was cast in News of the World, to be his second collaboration with director Paul Greengrass. Additional casting was in the works. ↑ Kim, Susanna (May 22, 2014). "The Richest Actors in the World Are Not Who You Expect". ABC Good Morning America. Retrieved August 5, 2014. ↑ "Tom Hanks Movie Box Office Results". Box Office Mojo. Retrieved January 25, 2019. 1 2 "People Index." Box Office Mojo. ↑ Weiner, Rex (March 28, 1995). "Tom Hanks Joins Back-to-Back Oscar Elite". Variety. Retrieved June 22, 2017. ↑ "Hanks' big splash in Hollywood". BBC News. November 5, 2004. Retrieved August 7, 2014. ↑ "President Obama Names Recipients of the Presidential Medal of Freedom". White House. November 16, 2016. Retrieved November 16, 2016. ↑ Mikelbank, Peter (May 17, 2016). "Tom Hanks to Receive France's Highest Honor for His Work Highlighting World War II". People. Retrieved January 6, 2017. 1 2 3 4 5 6 7 "Tom Hanks Biography". Biography.com (FYI / A&E Networks). Retrieved August 6, 2014. ↑ "Monitor". Entertainment Weekly (1215). July 13, 2012. p. 20. 1 2 "Tom Hanks Biography (1956-)". FilmReference.com. Retrieved November 28, 2014. ↑ Gordon, Julie (July 12, 2016). "Tom Hanks' mother dies". Page Six. Retrieved February 1, 2016. ↑ Gardner, David (January 1, 1999). Tom Hanks. Blake. ISBN 978-1-85782-327-1. ↑ Hale, Beth (November 8, 2006). "The all-American icons with British roots". Daily Mail. Retrieved April 26, 2016. ↑ "Female Nomad and Friends Interview: Sandra Hanks Benoiton". Archived from the original on May 23, 2013. Retrieved July 10, 2012. ↑ Lawrence M. Hanks, Associate Professor – University of Illinois at Urbana–Champaign. ↑ "Tom Hanks". biography.com. Retrieved April 8, 2018. ↑ Interview on Fresh Air. Aired April 26, 2016. 1 2 Terry Mattingly (March 25, 2009). "Mattingly: Tom Hanks talks about religion". Scripps Howard News Service. Archived from the original on March 28, 2009. Retrieved December 14, 2012. ↑ Zehme, Bill (June 30, 1988). "Tom Hanks Is Mr. Big". Rolling Stone. Retrieved July 2, 2017. ↑ Silverman, Stephen (April 15, 1998). "Hanks Thanks School". People. Retrieved February 1, 2018. ↑ Freedom du Lac, J. (February 19, 2004). "Show your ID: What do you call that university by the river? The new president steps into the name game". California State University. Archived from the original on February 5, 2014. Retrieved July 20, 2013. ↑ Blum, David (July 28, 1986). "Tom Hanks's Real Splash: A Funny Guy Grows Up in 'Nothing in Common'". New York. New York Media. 19 (29): 39. ISSN 0028-7369. Retrieved February 1, 2018. ↑ Mytnick, Colleen (October 2009). "Life According to Tom Hanks". Cleveland Magazine. Retrieved November 6, 2010. ↑ Lin, Joseph (May 10, 2010). "Top 10 College Dropouts". Time. ↑ "He Knows You're Alone (1980)". The New York Times. Retrieved July 10, 2014. ↑ Kushner, David (March 10, 2008). "Dungeon Master: The Life and Legacy of Gary Gygax". Wired. Archived from the original on October 31, 2014. Retrieved October 16, 2008. ↑ Cullen, Jim (February 28, 2013). Sensing the Past: Hollywood Stars and Historical Visions. Oxford University Press. p. 152. ↑ Isle, Mick (October 1, 2004). Tom and Colin Hanks. Rosen Publishing. pp. 11, 39. ↑ "From 'Big' To 'Brothers'". CBS News. Retrieved August 6, 2014. ↑ Television listings. TV Guide. November 27, 2003. Retrieved January 20, 2009. ↑ Riggs, Thomas (2002). Contemporary Theatre, Film, and Television. Gale Research. p. 117. ISBN 0-7876-5116-8. ↑ Encyclopedia of American Cinema. ↑ "Hanks' big splash in Hollywood". BBC News. November 5, 2004. Retrieved July 31, 2014. ↑ "The 61st Academy Awards (1989) Nominees and Winners". Academy of Motion Picture Arts and Sciences. Retrieved July 10, 2014. ↑ "'Sleepless in Seattle' Anniversary: Tom Hanks & Meg Ryan Classic Turns 20". HuffPost. June 25, 2013. Retrieved July 10, 2014. ↑ SCHICKEL, RICHARD (July 5, 1993). "Modern Romance". Time. Retrieved July 9, 2012. ↑ "Nominees & Winners for the 66th Academy Awards". Academy of Motion Picture Arts and Sciences. Archived from the original on November 13, 2013. Retrieved July 10, 2014. ↑ "Forrest Gump". Box Office Mojo. Retrieved July 10, 2014. ↑ Grimes, William (March 28, 1995). "'Forrest Gump' Triumphs With 6 Academy Awards". The New York Times. Archived from the original on October 21, 2010. Retrieved October 20, 2010. ↑ Teachout, Terry. "The Eclipse of Spencer Tracy". commentarymagazine.com. ↑ "The 67th Academy Awards". Academy of Motion Picture Arts and Sciences. Retrieved July 31, 2014. ↑ Perry, Keith and Alice Vincent (November 11, 2014). "Toy Story 4: everything you need to know". The Daily Telegraph. Retrieved December 26, 2014. ↑ "That Thing You Do! (1996)". The New York Times. Retrieved July 31, 2014. ↑ "Movie Reviews – That Thing You Do!". The New York Times. Retrieved August 4, 2014. ↑ "Audible and Playtone Launch Creative Partnership". The Wall Street Journal. October 15, 2013. Archived from the original on August 10, 2014. Retrieved July 31, 2014. ↑ "That Thing You Do! (1996)". rottentomatoes. ↑ "From The Earth to the Moon". Academy of Television Arts & Sciences. Retrieved August 4, 2014. ↑ "From the Earth to the Moon". tv.com. Retrieved July 9, 2012. ↑ "Making of Saving Private Ryan". Empire. October 1998. Retrieved June 10, 2014. ↑ "Saving Private Ryan (1998)". rottentomatoes. Retrieved July 10, 2012. ↑ "Nominees & Winners for the 71st Academy Awards". Academy of Motion Picture Arts and Sciences. Archived from the original on November 2, 2013. Retrieved July 10, 2014. ↑ "Tom Hanks". Golden Globe Awards. Archived from the original on October 6, 2014. Retrieved August 6, 2014. ↑ "The 73rd Academy Awards (2001) Nominees and Winners". Academy of Motion Picture Arts and Sciences. Archived from the original on April 14, 2012. Retrieved July 10, 2012. ↑ "Band of Brothers". Academy of Television Arts & Sciences. Retrieved August 4, 2014. ↑ "America: A Tribute to Heroes". CBS. Archived from the original on January 17, 2010. Retrieved July 10, 2012. ↑ "Nia Vardalos confirms 'bigger, fatter' Greek Wedding sequel to hit big screen". The Guardian. May 28, 2014. Retrieved August 4, 2014. ↑ "'My Big Fat Greek Wedding' Sequel in the Works From Nia Vardalos". HuffPost. May 28, 2014. Retrieved August 4, 2014. ↑ "Hanks files big fat 'Greek' lawsuit" Archived February 8, 2008, at the Wayback Machine – United Press International – (c/o NewsDaily.com) – August 8, 2007. ↑ "Tom Hanks". Archive of UPS article at Archive.org. Archived from the original on February 8, 2008. Retrieved October 21, 2011. ↑ "AFI Salutes a Humble Tom Hanks With Life Achievement Award". Los Angeles Times. June 14, 2002. Retrieved July 31, 2014. ↑ Levy, Rochelle L. "THE ACHIEVEMENT OF TOM HANKS". afi.com. Retrieved July 10, 2012. ↑ "The Da Vinci Code". Box Office Mojo. Retrieved July 10, 2014. ↑ "Hollywood Foreign Press Association 2008 Golden Globe Awards for the Year Ended December 31, 2007". goldenglobes.org. December 13, 2007. Archived from the original on December 15, 2007. Retrieved July 10, 2012. ↑ "The Great Buck Howard". magpictures.com. Archived from the original on October 11, 2012. ↑ "Mamma Mia! becomes biggest-ever hit at British box office". The Daily Telegraph. December 16, 2008. Retrieved July 31, 2014. ↑ "John Adams". Academy of Television Arts & Sciences. Retrieved August 4, 2014. ↑ "Where the Wild Things Are". Box Office Mojo. Retrieved October 19, 2009. ↑ "'Toy Story 3' Reaches $1 Billion". Box Office Mojo. August 29, 2010. Retrieved August 6, 2014. ↑ "Toy Story 3 highest-grossing animated film". The Daily Telegraph. August 14, 2010. Retrieved August 6, 2014. ↑ "Frozen becomes the biggest animation in box office history". BBC News. March 31, 2014. ↑ "The Pacific". Academy of Television Arts & Sciences. Retrieved August 4, 2014. ↑ "The first rule is no punching Tom Hanks". Chicago Tribune. June 26, 2011. Retrieved August 4, 2014. ↑ Dargis, Manhola (December 22, 2011). "Extremely Loud & Incredibly Close (2011)". The New York Times. Retrieved July 10, 2012. ↑ "Online Blockbuster? : Tom Hanks' Electric City Debuts on Yahoo Today". Retrieved July 17, 2012. ↑ "Game Change". Academy of Television Arts & Sciences. Retrieved August 4, 2014. ↑ "Bafta Film Awards 2014: Full list of nominees". BBC News. January 8, 2014. Retrieved January 8, 2014. ↑ Child, Ben (April 11, 2012). "Tom Hanks to play Walt Disney in Saving Mr Banks". The Guardian. Retrieved April 13, 2012. ↑ Kit, Borys (March 15, 2011). "Tom Hanks to Play Capt. Richard Phillips in Somali Pirate Hostage Story". The Hollywood Reporter. Retrieved April 13, 2012. ↑ Williams, Mike. "Tom Hanks becomes first actor to play Walt Disney on the big screen". Yahoo UK. Yahoo Contributor Network. Archived from the original on April 3, 2015. Retrieved October 21, 2013. ↑ Carlson, Erin. "Tonys: Tom Hanks Gets Nomination for 'Lucky Guy'". The Hollywood Reporter. Retrieved April 30, 2013. ↑ Hanks, Tom (October 27, 2014). "Alan Bean Plus Four". The New Yorker. Retrieved March 4, 2016. ↑ Waldman, Katy. "Tom Hanks Has a Short Story in The New Yorker. It's Not Very Good". Slate. The Slate Group. Retrieved October 21, 2014. ↑ "Tom Hanks publishes short story in The New Yorker and gets panned". The Straits Times. Singapore Press Holdings. Retrieved October 21, 2014. ↑ Shetty, Sharan. "Tom Hanks Lip-Syncs to Carly Rae Jepsen in the 'I Really Like You' Music Video". Slate. Retrieved March 7, 2015. ↑ Debruge, Peter (October 4, 2015). "Film Review: 'Bridge of Spies'". Variety. Retrieved July 10, 2016. ↑ Mclintcock, Pamela (May 14, 2014). "Cannes: First Look at Tom Hanks in 'A Hologram for the King' (Exclusive Image)". The Hollywood Reporter. Retrieved July 10, 2016. ↑ Dugan, Christina (October 2, 2015). "First Look: Tom Hanks as Heroic Pilot Sully Sullenberger". People. Retrieved July 10, 2016. ↑ Lesnick, Silas (April 27, 2015). "Production Begins on Ron Howard's Da Vinci Code Sequel, Inferno". ComingSoon.net. Retrieved July 10, 2016. ↑ Fleming, Jr, Mike (December 15, 2014). "Tom Hanks Eyes David Eggers' Novel 'The Circle' With James Ponsoldt: Hot Package". Deadline Hollywood. Retrieved July 10, 2016. ↑ Weldon, Sarah (October 29, 2017). "David S. Pumpkins saves the day with a Pumpkinmobile and song in SNL Halloween special". Entertainment Weekly. Retrieved October 29, 2017. ↑ "Tom Hanks Offers Toy Story 4 Update". Yahoo!. Retrieved June 20, 2016. ↑ "Tom Hanks to Play Mr. Rogers in Biopic 'You Are My Friend' (EXCLUSIVE)". Variety. January 29, 2018. Retrieved May 4, 2018. ↑ Hipes, Patrick (January 25, 2019). "'Morbius' & 'Ghostbusters' Solidify Summer 2020 Release Dates". Deadline Hollywood. Retrieved January 25, 2019. ↑ "Tom Hanks Is The Captain Now (Of A WW2 Destroyer In 'Greyhound')". theplaylist.net. ↑ D'Alessandro, Anthony; D'Alessandro, Anthony (July 2, 2018). "'Greyhound' Release Date Changes Again As Sony Moves Tom Hanks WWII Pic To March – Update". ↑ Lang, Justin Kroll,Brent (October 26, 2017). "Tom Hanks to Star in Sci-Fi Film 'Bios' From 'Game of Thrones' Director (EXCLUSIVE)". Variety. Retrieved October 27, 2017. ↑ "Tom Hank's Post-Apocalypse Flick 'Bios To Shoot February-March In Vancouver". August 22, 2018. ↑ "Universal Sets Tom Hanks' Sci-Fi Flick 'Bios' for 2020". The Hollywood Reporter. ↑ "Tom Hanks Biography". Us Weekly. Retrieved November 28, 2014. ↑ Leigh, Danny (January 12, 2001). "Desert island risks". The Guardian. Retrieved October 9, 2010. ↑ Suh, Jennifer (January 13, 2011). "Frat star to rap star: Chet Hanks". The Northwestern Daily. Retrieved June 25, 2011. ↑ "Truman Theodore Hanks, Born 12/26/1995 in California – CaliforniaBirthIndex.org". ↑ Fairchild, Mary. "Eastern Orthodox Church Denomination". About.com. Retrieved February 26, 2014. ↑ Rita Wilson (November 17, 2011). "The Joys Of Greek Easter". HuffPost. Retrieved April 4, 2015. ↑ "Tom Hanks reveals diabetes diagnosis: Did fluctuating weight play a role?". CBS News. October 8, 2013. Retrieved October 9, 2013. Academy Award winning actor, Tom Hanks announced on Monday that he is living with Type 2 diabetes on CBS' The Late Show with David Letterman. ↑ Zakarin, Jordan (March 8, 2012). "Obama Documentary The Road We've Traveled by Davis Guggenheim". The Hollywood Reporter. Retrieved April 8, 2018. ↑ Boucher, Philip (April 26, 2016). "Tom Hanks Predicts Donald Trump Will Become President When 'Spaceships Come Down Filled With Dinosaurs'". People. Retrieved July 20, 2016. ↑ Dolan, Maura (June 28, 2013). "Prop 8: Gay marriages can resume in California, court rules". Los Angeles Times. Retrieved December 3, 2013. ↑ "Tom Hanks Says Mormon Supporters of Proposition 8 'Un-American'" Archived March 5, 2009, at the Wayback Machine, Fox News Channel. ↑ Malloy, Allie (March 2, 2017). "Tom Hanks gives White House press an espresso machine". CNN. Retrieved January 27, 2019. ↑ Weaver, Hilary (March 2, 2017). "Tom Hanks Sent a Gift to the White House Press Corps". Vanity Fair. Retrieved January 27, 2019. ↑ "National Space Society Board of Governors". Retrieved July 10, 2012. ↑ "The Narrator:Tom Hanks". imax.com. Archived from the original on July 8, 2012. ↑ "Rose Center for Earth and Space at the American Museum of Natural History". ny.com. museums. ↑ "Douglas S. Morrow Public Outreach Awards: Recipients". spacefoundation.org. Retrieved April 21, 2014. ↑ "Douglas S. Morrow Public Outreach Award". Space Foundation. Retrieved November 3, 2015. ↑ "Tom Hanks into Army's Ranger Hall of Fame". USA Today. June 29, 2006. Retrieved April 21, 2014. ↑ "The Dave Clark Five". Captainerniesshowboat.com. Retrieved March 15, 2011. ↑ Hanks, Tom. "I Am TOM. I Like to TYPE. Hear That?". Retrieved August 17, 2015. ↑ Hawkes, Rebecca (March 24, 2015). "Tom Hanks: eight true stories about 'the nicest guy in Hollywood'". The Telegraph. Retrieved August 17, 2015. ↑ Spangler, Todd (August 18, 2014). "Tom Hanks' Free iPad Typewriter App Climbs to No. 1 on Apple's App Store". Variety. Retrieved August 17, 2015. ↑ Dockterman, Eliana (August 18, 2014). "Tom Hanks' Typewriter App Is No. 1 in the App Store". Time. Retrieved August 17, 2015. ↑ "Tom Hanks to pen book of stories inspired by typewriter collection". BBC News. November 4, 2014. Retrieved August 17, 2015. ↑ Hanks, Tom (October 2017). Uncommon Type. Knopf. Retrieved October 25, 2017. ↑ "How Tom Hanks Slowly Became America's Dad". Esquire. September 8, 2016. Retrieved January 30, 2018. ↑ "Tom Hanks profile at Box Office Mojo". Boxofficemojo.com. Retrieved March 29, 2016. ↑ "12818 Tomhanks (1996 GU8)". NASA.gov. Retrieved August 3, 2011. ↑ "The Best Actors in Film History". Ranker. ↑ Kennedy, Merrit (November 16, 2016). "These Are The 21 People Receiving The Nation's Highest Civilian Honor". NPR. Retrieved November 16, 2016. ↑ Roberts III, Faimon A. (May 11, 2016). 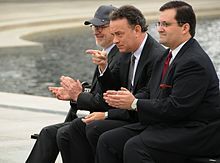 "National World War II Museum president and supporters Tom Hanks, Tom Brokaw to receive award in Paris". The New Orleans Advocate. Archived from the original on December 27, 2018. ↑ "BBC Radio 4 – Desert Island Discs, Tome Hanks". BBC. Retrieved December 18, 2016. ↑ "Tom Hanks speaks of lonely childhood in emotional Desert Island Discs". The Guardian. Retrieved January 4, 2017.